Those of you using your Android phone as an internet connection may be paying more than you need to pay. Many phone companies here in the US charge extra to enable tethering capability, either by providing their own OEM tethering app or by enabling the phone to serve as a Wi-fi hotspot. With some experimenting, I found that my Motorola Droid 2 Global from Verizon can be tethered just fine right out of the box, and without paying anything extra. Recently I’ve been playing nursemaid to my ill mother, so I frequently take my work along with me on overnight shifts. I’ve settled on connecting to my main desktop machine via remote desktop, and using my 15″ laptop as the client. The remote desktop connection works great. My 3G connection is noticeably slow, but it’s very workable. Since I’m working on my office computer, there’s no need to sync anything, and I can pick up from one place right where I left off in another. In a pinch I can even use my phone as a client (using an inexpensive remote desktop client from Xtralogic). To get my internet connection, I installed Motorola’s drivers on my Windows 7 laptop, then enabled the Bluetooth controller on my phone and paired it with the laptop. 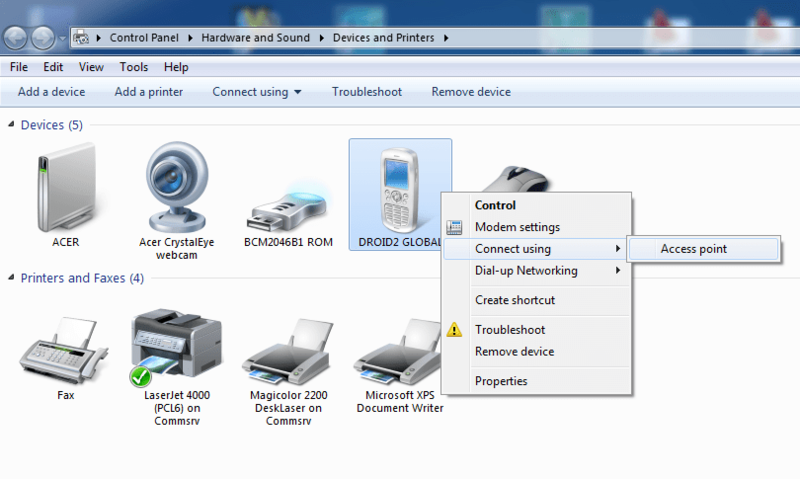 Now I can connect my laptop to the internet via Control Panel simply by connecting to the phone as an “Access Point”, as shown below. I don’t know whether this technique works for other phones or other carriers, but it has certainly worked well for me. Owen, now that you have used this for about a month, I must ask, did you get hit with any surprise charges. IOW, is Verizon able to determine if you are tethering to a computer? I’m trying to figure out how to get my Blackberry tethered. No, there have been no additional charges, and I have used it extensively. I do have an unlimited data plan, otherwise I’m sure I would have exceeded my allowance. Any suggestions on my Blackberry? I dont have the same options you do when right clicking, it is almost as though my phone is treated as a storage device. Sorry, I’m afraid I’m not much help with your Blackberry as I’ve never owned or used one. Hi Owen. I’ve also been playing nursemaid to my elderly father whose been hospitalized several times over the past few months. When he’s there, I take my notebook with me to his room so he can use his PC at home remotely, using the hospital’s public WiFi. I found that TeamViewer (www.teamviewer.com) is superior to Windows Remote Desktop and other similar solutions, and has quite a bit of extra functionality, like integrated file transfer, VOIP, Video chat, etc. The thing I like the most about TeamViewer (aside from the fact that it’s entirely free for non-commercial use) is that it allows you to reboot the remote PC and regain access.